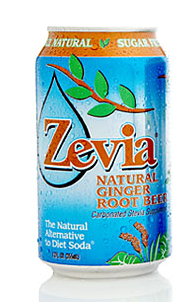 Recently we were invited to try the new diet soda alternative Zevia, the soda made with the Stevia supplement instead of harmful artificial chemical sweeteners-- specifically their new Ginger Root Beer flavor. This led to the following brilliant insight on the part of my son Evan, who then enlightened me--Root Beer is flavored with Ginger Root! Hence the name! Ginger! Root! Ginger Root! That's right, until that day I never realized that the traditional flavor of root beer has always been made with ginger. These two dots have now been formerly connected in my brain. I always thought "root beer" was some mysterious un-named plant or flavor that gave it the distinctive root beer flavor. Maybe there was a plant called root beer plant. But no. "Root" is just a shorthand way of referring to ginger root. Once identified, it is forehead smackingly obvious, but in my defense may I point out that my son Evan had the same revelation that day. We owe this new culinary insight to the good people at Zevia, who had the sagacity to put the word ginger in the title of their fourth new soda flavor. And it's good! This new flavor makes it even easier to order a case of 24 from their web site, allowing you to try all four flavors if you wish. My family was fairly unanimous in their positive review of the new ginger root flavor of Zevia. "I like it the best," said Ethan. Jim said "Their new flavors are always the best". Evan says "it's made with ginger!" Me? I like it too! I enjoy the subtle flavors, gentle and refreshing. Having struggled with a diet soda addiction myself, as well as caring for a diabetic loved one, it gives me great pleasure to have a natural and healthy alternative to sodas made with artificial chemical sweeteners. ZEVIA is made with Stevia, the sweet-leaf plant supplement that is hundreds of times sweeter than sugar but with zero calories. For those of you rightfully concerned about the ethics of the diet soda industry: Please be advised that Zevia is completely GMO free, and is NOT associated with Coke or the Cargill company in any way. Zevia uses pure Stevia, as it occurs naturally. This is important, because industry reports are that the Coca-Cola company, in association with Cargill, has plans to develop a genetically modified (and hence patentable) version of stevia called "Rebiana". I do NOT support GMO foods, nor this attempt by Coca-Cola and Cargill to continue their monopolies in the beverage industry. Furthermore, if one is to consume diet sodas at all, I encourage the support of companies like Zevia who refrain from the use of GMOs and who have the health of their customers firmly in mind. Indeed, the concern with health is why Zevia was created in the first place! Please have a look at their web site to learn more about their history. One final note to the commenter who tried to leave a note stating that Zevia was part of the Coca-Cola/rebiana/Cargill unholy trinity: Please get your facts straight before you make acusations against a company that is trying to provide a genuinely healthful alternative! Zevia is one of the good guys in the beverage industry. Previous Zevia reviews: here and here. I am a coffee drinker. Two cups, every morning, is my cherished ritual. It wasn't always so; my first beverage of choice was black tea which I drank every day after school, while watching the desperately gothic and deeply earnest supernatural soap opera known as Dark Shadows. God I loved that show, and its creepy manor house crawling with vampires, ghosts, witches, tormented souls, weekly cliff hangers and the surprisingly frequent technical gaffes and acting blunders (stage hands caught on film, boom mike shadows across actor's faces, etc.) that were caught on film for posterity. Consequently I cannot think of tea without a very fond association with American-British kitsch. I make no apologies-- it is what it is. I don't know when I switched from tea to coffee, (college days, perhaps?) but I still enjoy the occasional hot cup of tea. My favorites back in the day were Darjeeling and Earl Grey. But somewhere along the line I stopped seeking out really good tea, and so it is no wonder I stopped drinking it. Not so long ago, I was invited to taste a selection of teas from the Indonique Tea Company (full disclosure: the tea was complimentary) and set about brewing a proper cup of tea. I say proper, because there is a right and a wrong way to make tea. I immediately proved this to myself by trying their green tea first, because frankly I had never been much of a fan of green tea until I drank the one sent by Indonique. So that's what green tea is supposed to taste like! I exulted. When steeped for the recommended three or four minutes, (not one second more), the bitterness that had repelled me from green teas in the past was simply gone, leaving behind a bracing and clean tasting tea which I found very relaxing and refreshing at the same time. It made me even more excited to try their black teas. They did not disappoint. You who read my blog regularly know that I love a bit of ritual and tradition. That tea pot you see in the picture above belonged to my Grandmother, and it has a campy surprise (not unlike the Dark Shadows music box theme for "Josette") hidden within. You see, there is a small music box hidden in the base of the tea pot, with an on/off switch that is released when the pot is lifted off the table to serve tea. Now I ask you, who can resist a spot of tea (for two!) under such conditions? 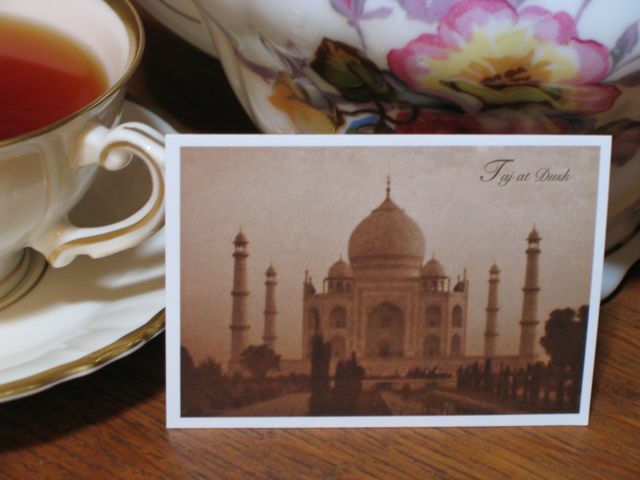 In their packages of tea, they secret away a little postcard image of the Taj Mahal, so that I can day dream that I am receiving a note from a far off and romantic land while I sip the tea. 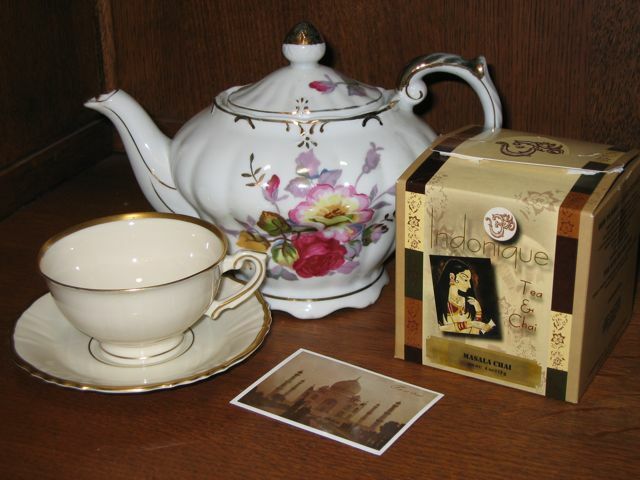 To get your own taste of really excellent tea, and hopefully a post card from the Taj, look no further than indonique.com , and while you are there be sure to visit the page where they share some entertaining "East Meets West" Punjab-Hip Hop-Rap style music videos. It's quite something and will make you sit up and want to listen to new music while you try their chai tea blends. (Their chai was an especially big hit with the men in my family). Indonique used to have a store front in New Orleans, until hurricane Katrine blew into town and forced them to reconsider their business model. Their solution has been to create an online business, with ten percent of their wholesale profits going to charity. I like that. I find myself craving the sunlight these days, and after a few days of grey fog, Nature has obliged me with a bright and cold afternoon. I have been told that a vitamin D deficiency will result in a craving for sunlight, as well as muscle cramps. I am busted on both accounts. One day my husband came home early from work to find me laying on the kitchen floor on a mat, just so I could soak up the sunlight streaming through the kitchen window, in a feline stupor. I love our house but it lacks sunlight, a serious problem in my book. A new house is being built on the lot behind ours, and I am fearful it will take away my morning light at the bedroom desk or on the "Sun Porch". Will I survive? I don't know. As I said, I've been suffering from awful muscle cramps in the last few months. They wake me at night, silently screaming in pain, struggling to get out of bed and walk it out without waking my husband. I had read once that being dehydrated will cause muscle cramps, or a lack of potassium, but a co-worker informs me it is also caused by a lack of Vitamin D. I drink water, I doubt I lack potassium, but during the winter months I am told it is difficult for we who live in the "northern latitudes" to get enough sun on our skin. So I hope the Vitamin D supplements I bought will help until the Sun inches closer in the sky and I can catch some rays. In this neck of the woods, it's still winter, folks. 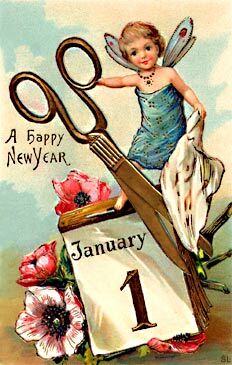 Many people start the New Year resolving to improve their diets, and that often includes cutting down on sugar. But artificial sweeteners such as Splenda usher in a host of consumer complaints and concerns about whether or not such chemicals do more harm than good. Because my husband is diabetic, I have searched for alternatives to chemical sweeteners so that I can protect his health and provide delicious, nutritious food, including the occasional dessert, at the same time. Then we discovered Zevia, a soft drink made with the naturally sweet herbal supplement known as Stevia. Perhaps you listened to the podcast Taste Test our family recorded when the four of us sat down to try Zevia for ourselves, comparing it to regular sodas. Enter Zevia 2.0, a reformulated Zevia that promises to improve the flavor of this safe alternative to diet soda. Did it measure up? I sat down again with my husband Jim and our two sons Evan (22) and Ethan (18) to form an opinion. I hope you enjoy listening in on our conversation, this time edited to a more condensed seven minutes of discussion. Want to hear more Rookie Podcasts? Let me know in the comments section, please! PS New Zevia Ginger Root Beer flavor reviewed here. Thanksgiving Post-Op: What I Wish I Knew Last Thursday! I know what I am having for dinner tonight: The Barley 'Risotto' with Turkey and Mushrooms that Mark Bittman profiled on Nov. 21! And oh, how I wish I had read Mark Bittman's article on making gravy the week before. It would have saved me (and my family) from yet another experience of "just OK" gravy that did not deliver the flavor I wanted, despite my frantic efforts to Make It So. Only once have I made Really Good Gravy. This has been my Gravy Grail to seek annually ever since. It was several years ago, and even though I think I'm doing the same thing, it has eluded me. I even used the giblets to create a little stock, with onions and carrots, to flavor the gravy. No dice. It was bland and even (horrors!) lumpy! Mark Bittman makes the brilliant suggestion to make the gravy in the days *before* Thanksgiving--it will keep-- using the standard process of making a roux with stock and seasoning. Heresy? I don't care! I'm going to try it, instead of the usual desperate attempt to make golden sauce in the already very busy minutes before we sit down to eat. In addition Bittman shares several other tasty sauce recipes that provide an alternative to the standard gravy. Here's another post-Thanksgiving discovery that I found very helpful: Third generation butcher Ray Vanezia shows very clearly how to carve a turkey so as to reap the greatest amount of meat, and arrange it attractively on a platter for your guests to enjoy. My husband has done a very good job on the turkey lo these many years, but even he could stand to learn a thing or two from this video. Hie thee hither and see for yourself. See what happens when I get too busy to read my favorite food writers? Next up: More Thanksgiving highlights. All ingredients were fresh and seasonal, often coming from the plants growing in the chef's own back yard, where we dined along a table set with glowing candles and smiling faces. I was impressed that the amount of food in each course was just about right; I was able to enjoy every bite and still have room for whatever came next (though just barely!) 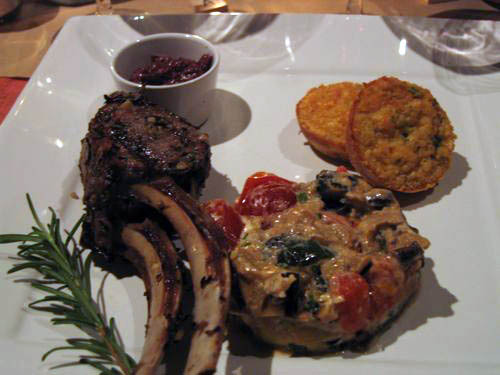 The various textures and flavors were vivid, and it's hard to choose my favorite, but if pressed I would have to choose the rosemary rack of lamb. It was tender and delicious. Dinner guests included some of my favorite food blogger friends such as Elise, Garrett and Fernanda Rosa (check out her blog for great pictures, even if you can't read Portugese!) And although several of us brought a bottle of wine to share, we were also treated to a taste from bottles brought by Raul, a private chef who also works for the Vintner's Collective in Napa, and Ashley Teplin of Studio 707. The publisher of Edible Sacramento was there as well as food reviewers from other publications who were in stealth mode, and whose "covers" will not be blown here! Part of the charm of a Hidden Kitchen dinner party is the knowledge that it is part of an underground movement of alternative fine dining experiences that offer something unique and different from a more traditional restaurant. 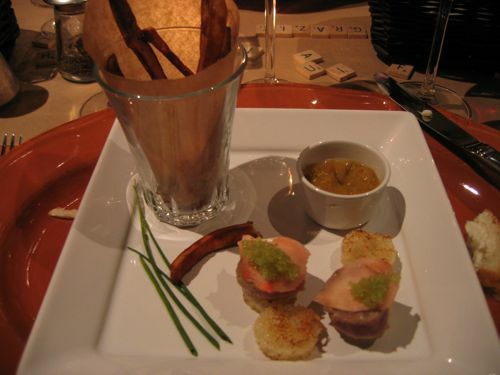 The menu is chosen by the chef, and the focus is on the food and conversation rather than a wide variety of menu options or the decor of the room. The setting is intimate and very personal. I highly recommend it for the adventurous diner who enjoys being surprised and delighted. NOTE: Special thanks to Elise for sending me Photoshop enhanced versions (brighter and cropped) of my pictures! What a pal. Behold the glory of the mufaletta sandwich! This monster is meant to be party food--by which I mean, sliced and shared, preferably with a cold beer, whilst playing a stirring game of billiards. (Wash your hands before taking your next shot). A round loaf of a rustic french bread. Spread tapenade on the bottom of the interior of the loaf of bread. Now layer the meats, cheeses, onions and greens, alternating colors and flavors. Finish with another generous spread of tapenade. Return the "lid" of bread to the loaf. 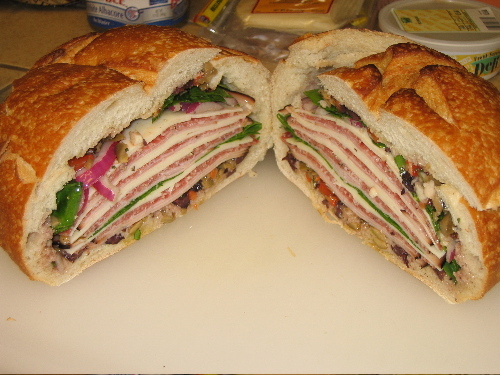 Slice the loaf in half, exposing the layered sandwich interior. 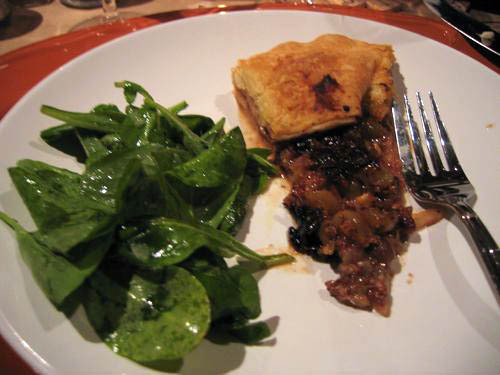 Then slice into individual servings or allow your guests to help themselves. My older son Evan is a senior at UC Berkeley. He writes reviews (usually about music or local events) for the online school newspaper, the Daily Cal. When I went to read his latest article, what should I see but his brilliantly written Sorority food review. That's right. A Sorority Food review. What can I say? The kid's a genius. 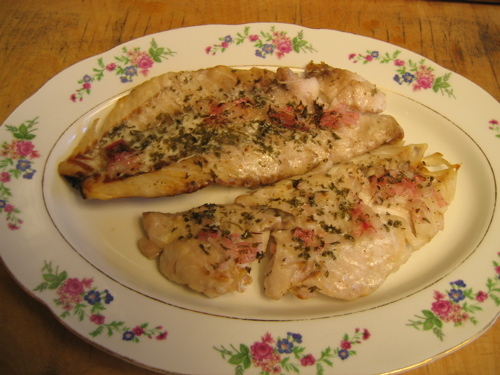 I have a new favorite fish dish: Broiled red snapper. I chose red snapper only because I knew I thought fish would go well with the zucchini I was going to serve with it. It was perfect! I didn't really know what to do with it, but I consulted Helen's blog Beyond Salmon and saw that it was a semi-firm fish that could be broiled, just as I have done with salmon. So I mixed up a little olive oil with some diced shallots, salt and pepper, and a generous squeeze of lemon juice, drizzled it over the fish and broiled it for several minutes on each side. It was well received by everyone at the table. I think I may have thrown on a little garnish of parsley flakes too. Like everyone else with a kitchen garden, I am up to my elbows in zucchini right now and looking for tasty ways to prepare it. 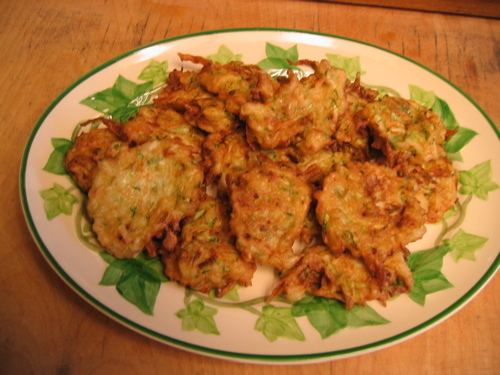 When I saw this zucchini fritter recipe on Simply Recipes, I knew I had to try it. The only modification I made to Elise's recipe was to add a generous dash of cayenne pepper to the fritter mix. It was the perfect amount of heat, and only enhanced the delicate interior and crispy exterior of the fritters. Another hit, and a nice complement to the fish along with a fresh green salad. It sure is nice to know I can count on my favorite food blogs to keep me inspired in the kitchen. So I've been making salads and sandwiches, with minimal cooking going on. A real winner, no matter the weather, is this terriffic tuna sandwich recipe from Rachael Ray. Yes, that Rachael. No snippy remarks, please, because the heat is making me cranky and Rachael deserves some respect. This is a killer sandwich! Try it! *Note: Rachael's original recipe has you simmer a tuna steak in water infused with lemon, a bay leaf and peppercorns, then drain it and flake the tuna. 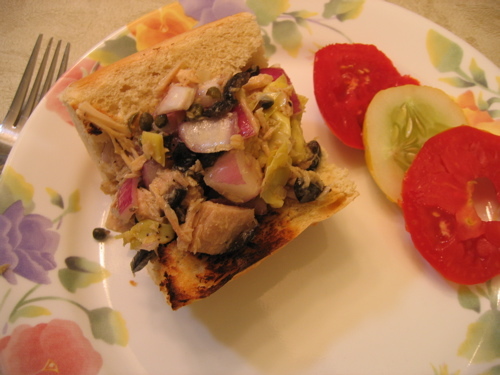 I just used good canned tuna so far and it is delicious and a good pantry staple. Mix up all the ingredients (except the bread) and let it sit a bit. Slice the baguette length-wise and toast if desired. Carefully tear some of the center of the bread out of the loaf, to create a hollowed out area to hold the tuna mixture. 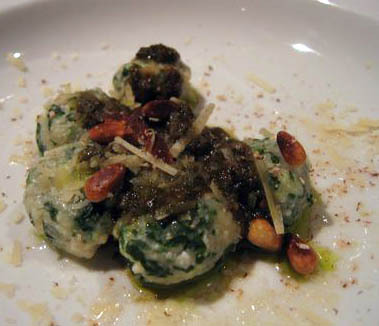 (Reserve the removed bread to make bread crumbs or a panzanella salad later). Fill the bread with the tuna mixture, pressing it firmly into the bread cavity. Slice and serve. This sandwich filling only gets better as it sits in the fridge over night. 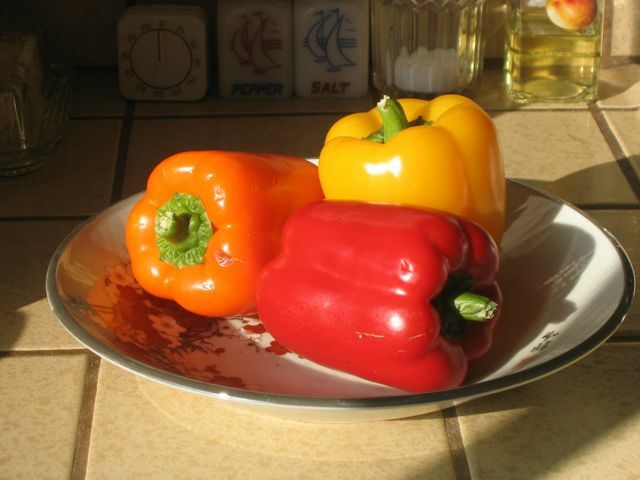 It is SO good, and makes good party food as well as helping keep the oven off on scorching summer days. I hope you try it!